GoPro is an amazing sports camera and having a nifty floating handle grip increases the joy of sports / hobby videography. 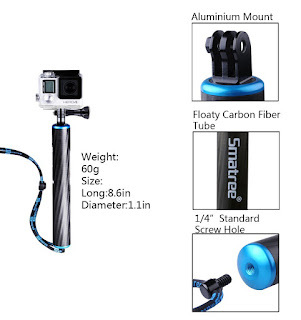 Bag this Smatree® SmaPole F1 Floating Hand Grip / Floating Pole / Bobber (Aluminum & Carbon Fiber Materials) Integrated With Aluminium Alloy Tripod Mount and Nut + Plastic Thumbscrew for GoPro Hero, Hero 4 Session, Hero 4 Black/Silver, 3+, 3, 2, 1 HD Cameras (Blue) with coupon code U3OEQCF7. The adjustable strap tightly attach SmaPole F1 to your wrist, prevent the GoPro cameras from falling off. With a 1/4 inch standard threaded hole at the bottom, you can insert the SmaPole F1 to 1/4 inch tripod mount connection adapter.